I did not dare to do an unboxing video as I usually do with iToys because I figured I needed to learn to fly this thing first or otherwise that might be quite embarrassing to watch. Several weeks have passed now and I never got around to documenting my experiences I made. Until now. So let me summarize all you need to know if you are considering getting one of these flying pieces of amazing engineering as a creative diversion next to your programming workdays. The first assumption that will turn out to be false is to be thinking that the 300 bucks are the only kind of money you will be sinking into your new hobby. That’s just to get you started. As soon as you begin to need spare parts or want to experiment with aerial photography the costs start to rise. You receive the drone in a beige box that contains a charger, one 1000 mAh battery, an outdoor and an indoor hull and some basic instructions. 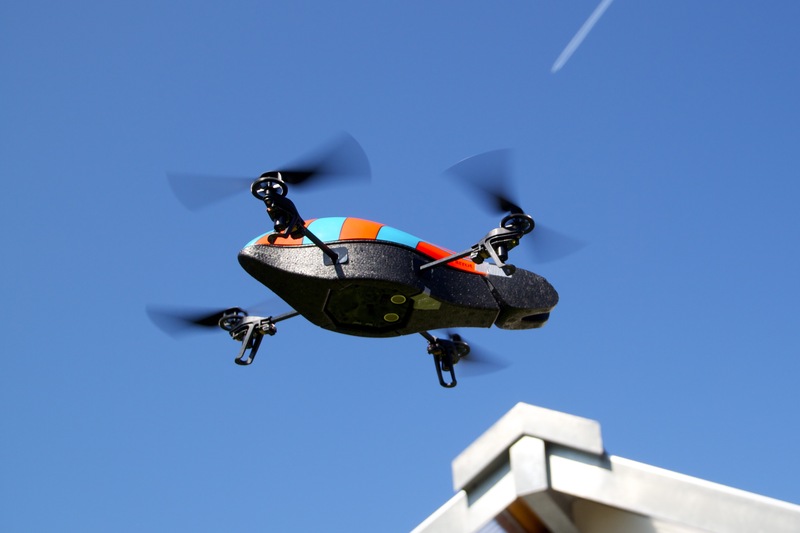 The battery needs to be charged which takes around 90 minutes, during which time you should visit the official AR.Drone site and watch the instruction videos. The bare essentials are containted in the Free Flight app which works equally well on an iPhone, iPod Touch or iPad. It is recommended you put your iPhone into Airplane Mode and then turn on Wifi and connect to the drone’s ad-hoc network. 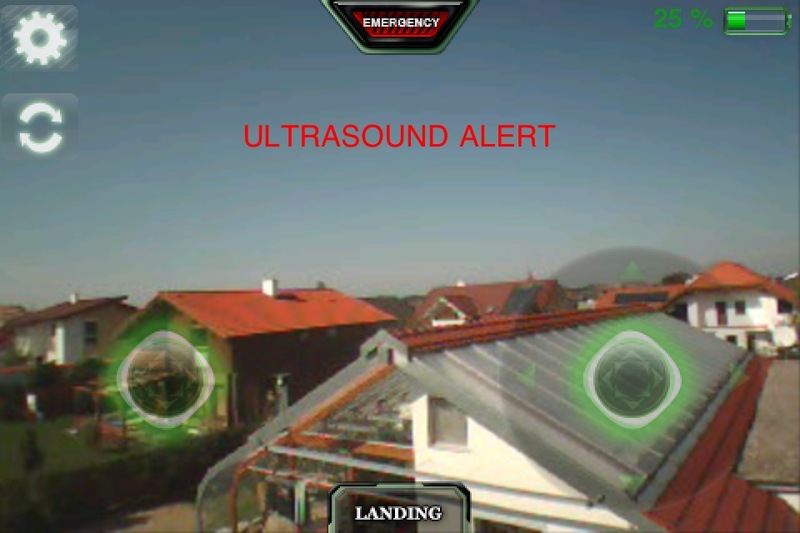 Then you start the app which will check the firmware version of the drone and update it if necessary. I found that I prefer to control the drone with my iPhone because while it is a cool bonus to have two cameras on board, you should not look at the screen but watch your drone while flying. So it does not matter that your fingers cover the video, but instead you have more direct control over the actions. The default control mode is to have a button on the left side, anywhere you touch the screen. While you depress this the tilt movements of your device get translated in synchronous tilt movements by the drone. On the right side you have a 2-axis controller, again anywhere you put your finger down. Up and down makes the drone climb and fall. Left and Right cause it to rotate. Pros call this motion “yaw”. It is best to start in a wide space indoors with the indoor hull. This has additional protective rings around the rotors but the distinct disadvantage of giving wind much additional surface to work on. So stay indoors and make sure you have a couple of meters in each direction to maneuver. Best might be to have a garage or if you are lucky an actual flight hangar. The smaller the space the more likely you will crash your drone. The main beginner’s mistake is to yaw the drone such that the camera points towards you to make some pictures. It is ok to be a bit vain, once you mastered the controls, but right the beginning it is a very bad idea because your brain has not yet switched to reverse the control movements for this scenario. You tilt right and the drone moves left, right into the next wall. While you are doing your first controlled movements, staying behind the drone, you will inadvertently have your first crashes. Don’t worry too much, the drone is an amazing feat of engineering that survives most of the basic crashes without any problem. When touching the wall causes the protection ring to touch a propellor the on-board electronics simply cuts power. After every crash you should set the drone upright again and in the settings reset the trim. Then you just press the lift off button again and you continue. The original battery that comes with the drone is good for 10-20 minutes. I had to send my first drone in once to get it exchanged because mine only lasted for 3:30 minutes and Parrot support told me to get it exchanged. Once you have gotten used to controlling the drone, and also learned how to adjust your movements when the drone faces a different direction than you, you can move outside. Make sure that there is as little wind as possible because again this makes it harder to avoid crashes. Outside you need to take the hull without the rings and so your prop blades are now going to take some serious torture when you start cutting your plants. Trees are the drone’s mortal enemy, while it quite likes to crash into your soft lawn. Don’t forget to switch to outdoor mode and outdoor hull in the app’s settings. This changes some of the calculations the electronics as well as changes some of the other settings. If your first configuration has survived long enough to go to this level 2 then you will be probably be tempted to see how high you can go. Only to find that there is a maximum altitude. The drone uses an ultrasound sender and receiver to measure the altitude and the default setting is limiting how high you can fly. Of course you are confident now that you can steer the drone even at altitude and so you quickly disable the limiter. Above a certain altitude the ultrasound will no longer be strong enough to measure the altitude and so you see a blinking warning to that effect. You should also try to stand behind the drone when you fly high for a simple reason: wind speed increases the higher you are. Even if there is next to now wind where you stand there might be some more air movement a couple of meters up. This air movement will take the drone with it and you need to be able to compensate. When you do that the altitude of your drone is only limited by the range of your Ad-Hoc Wifi connection. Note that if the connection gets lost the drone might just cut all engines and drop like a stone. Or it might just keep on doing what it was doing before. So testing the range of wifi towards the sky might not be a truly smart idea. Better to do such experiments horizontally over a field. Landing is always best done by means of the landing button at the bottom of the screen. The emergency button at the top cuts all engines should you ever feel the need to. If you crash it enough – and mark my words you will – you will develop a need for spare parts. All elements that make up an AR.Drone can be purchased individually. Looking for an expert store on the web I found and stuck with DroneTuner, a small online shop based in Ireland. The first purchases I made there were for a set of shafts and the official tools. Even though the shafts are made out of metal they seem to bend when the prop hits something hard. While I was at it I also ordered a set of high performance ball bearings which make the rotors run smoother because they have a tighter fit with the shafts. Then you also will want to purchase additional batteries because only flying for 12 minutes at a time is just too little. DroneTuner has some Lithium Polymer batteries that have the same specs as the original ones, but 50% more capacity, i.e. 1500 mAh instead of 1000 mAh. Parrot warns you to only use official batteries but I found nothing wrong using the larger ones. On my third order I had to also purchase the central cross on which the four motors and the central electronics are mounted on. My drone crashed into a tree high up and the drop to the ground had one of the beams break at the root. Superglue to the rescue, it fixed it several times since then, but I still will need to eventually exchange the cross for a whole one. I have seen one company already that has two downed drones but nobody ever takes the time to order the appropriate spare parts and get them airworthy again. My point being, that the AR.Drone is too expensive at toy to “just try it out”. It needs a commitment to hone your skills and make the necessary repairs when you need them. The drone might just be a toy but we couldn’t call ourselves engineers if we didn’t also want to experiment with recording some video while flying. As you can see from the screenshots above the quality of the camera is only barely useful for this purpose. Though there are already several apps on the app store which allow you to take pictures and record video to MOV files. One such app is Flight Record for $5. I found though that I get too many dropped frames to have good video and also the resolution is too bad to be useful for anything else but experimenting. There are two other viable options that other drone pilots have developed. Option 1 is a small “Keychain Camera”, Option 2 is to use a GoPro cam. I bought myself such a Keychain camera plus mount from Dronetuner to experiment with it. It records AVI files on MicroSD cards. Theoretically class 4 cards are supported but you have to get a class 6 because otherwise you will drop frames. I spent around 100 Euros on all the things I needed for this experiment but in the end I found that there is a severe design flaw. If your props are somewhat banged up then the whole drone will vibrate slightly. This may be much less with new props, I have not tried it yet. These vibrations cause the video from the keychain cam to show horizontal waves moving vertically over the picture. I suspect that is because of the long time it takes for the cam to record a single frame picking up the slight movement while scanning the CCD chip. Possibly another reason for this might be that I only had a class 4 card to test with. My next experiment will be with a GoPro Hero HD camera which you can mount on top of the battery which is protected from the motor’s vibrations by some foam. That’s actually the same camera that Parrot themselves used for some of the demonstration videos. Though that’s another expensive toy, one such camera has the same price tag as one drone. Well, one needs a hobby. Once you got the video thing out of your system you will want to train to become a better pilot. One of the “moves” I quite like is to fly coordinated turns. Those are difficult to fly well because you need to coordinate a forward tilt, a sideways tilt and a rotation. Too much or too little of any one will make it look less pristine. Another thing to try is to play like a real live Chopper. You fly to the other side of your garden, pretend to pick up some refugees and then you return to where you’re sitting. Yes, sitting, we geek pilots wouldn’t stand, would we?! 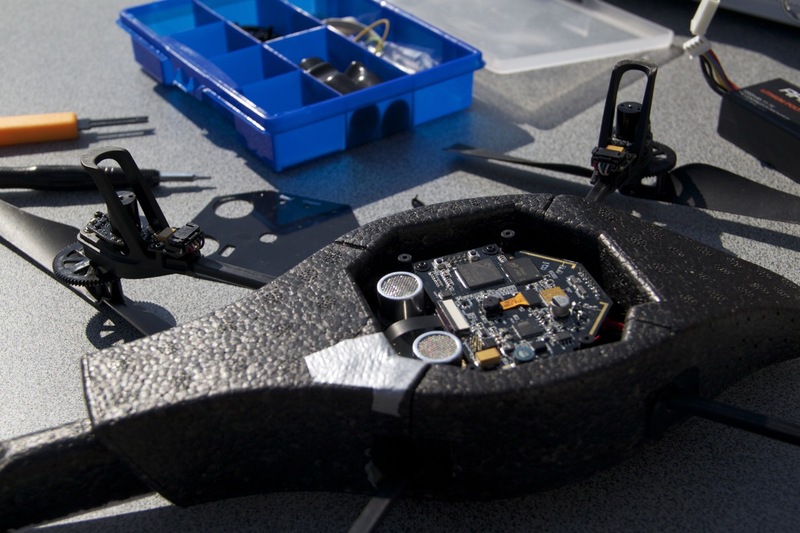 Finally one cool idea by Parrot is to fly races. For these you just get the free AR.Race app and then you define a round course for yourself. This can be in your house or in your garden and can be any route you like. Just make sure that you have sufficient room to maneuver and that you can remember the route even when you are trying to best your lap times. That’s a great way to keep honing your skills while playing a game. 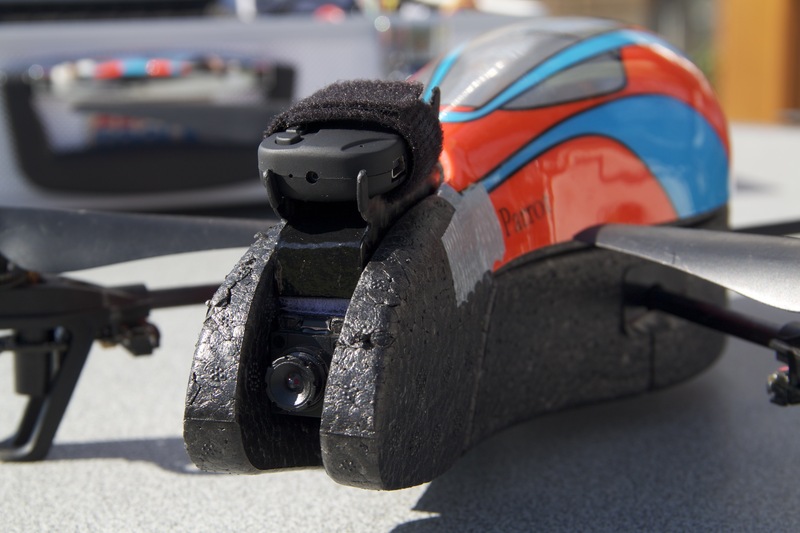 In the “Rookie mode” you tell the drone that a lap is over by tapping onto its upper hull twice. So you fly the lap, tap tap. Fly another, tap tap. And when you’re done you land. Now if that is not enough fun you can get some extra props for your race course, pylons and a donut. These are inflatable and the bottom camera of drones is able to pick up the line to detect you passing the checkpoint. It’s on MY wish list for Christmas. I wish I would know somebody close who also has a drone to techno-babble about it or try out the shooting games. But until then I will continue to step outside every 90 minutes to take a flying break, it’s a much healthier alternative to smoking or not taking any breaks from coding. The AR.Drone is truly a marvelous piece of hardware, for both apprentice and experimented pilots. 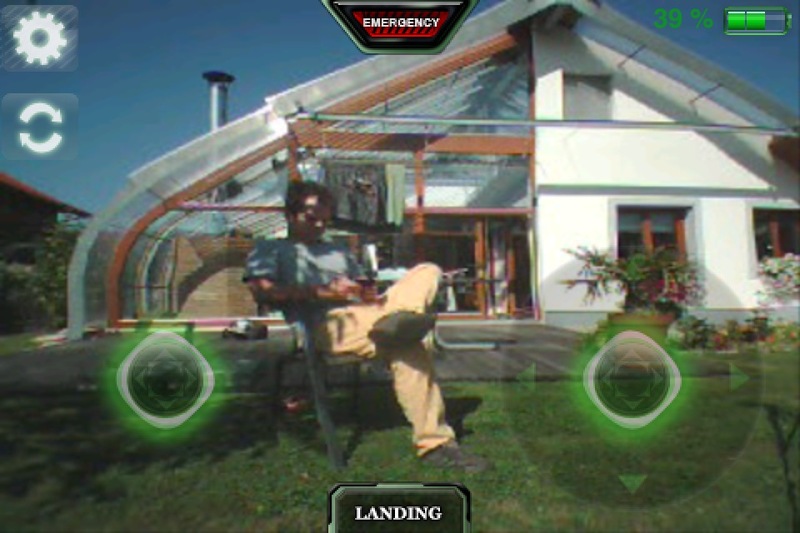 As newbies in this game (but professional programmers), we proposed a simplified interface to pilot the drone with a pad. We didn’t use the Parrot common view, but instead completely changed the user experience, with a modern design. The app is called DronePad for the iPhone and DronePad HD for the iPad. Check them out if you have time.